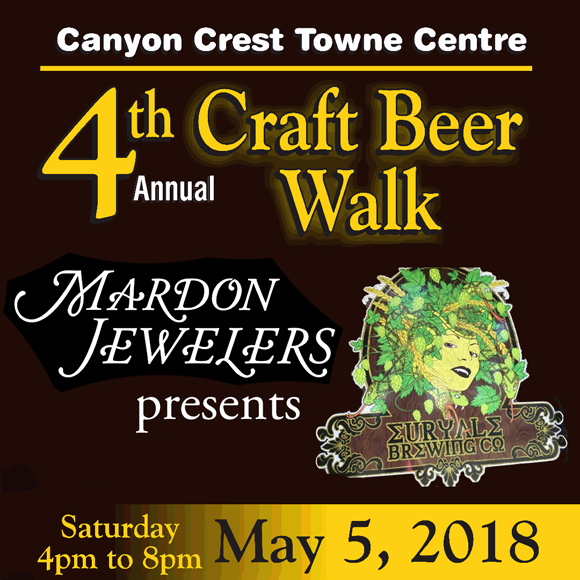 The 4th Annual Craft Beer Walk at Canyon Crest is next Saturday, May 5. The Walk starts at 4 pm and lasts until 8 pm. This is your chance to visit interesting shops, see new things and sample local Craft Beers and tasty knoshes in a relaxed atmosphere– and you don’t have to fight the freeway! Tickets are available at Mardon Jewelers and other merchants in the center– $35 includes beer and food, $25 for food only. Your ticket will entitle you to quaff delicious local brews and nibble new snacks, meet the merchants and experience the latest in jewelry, books, clothing, and services. Mardon is featuring the unique beers and ales of Euryale Brewing Company of Riverside. This local micro brewery is known as one of the best in the Inland Empire — check out their website, http://www.euryalebrewing.com/. The Press has announced that voting for the annual Reader’s Choice survey will begin next Tuesday, May 1. You’ll be able to vote at PE.com/vote!Ebest. Many of you may know that Mardon has won Best Jeweler of the Inland Empire for 9 years in a row. Let’s go for 10! In the coming weeks, we’ll keep you posted on new happenings at Mardon. Speaking of happenings, the 4th Canyon Crest Towne Centre Craft Beer Walk is on Cinco de Mayo! We’ll be featuring local craft beef from Euryale, one of Riverside’s award winning small brewers. Munchies too! Tickets are available at Mardon and other merchants in the Centre. Proceeds benefit the Riverside Community Arts Association. 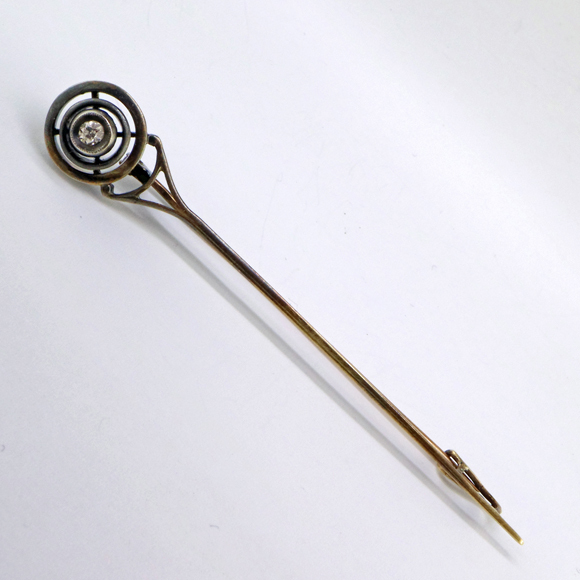 Just acquired: this sweet little Art Deco brooch. 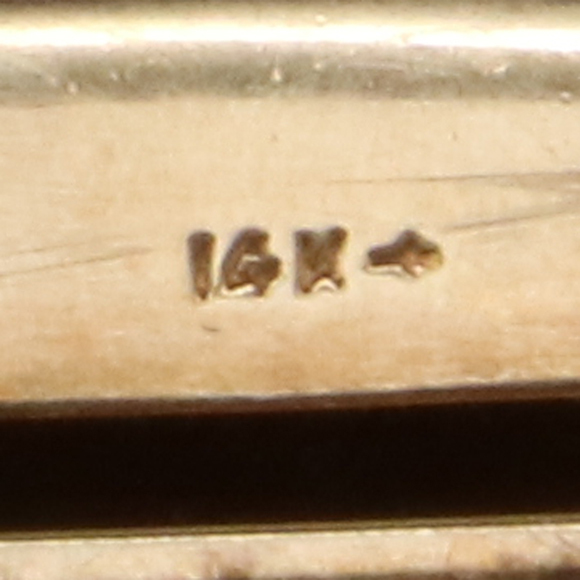 During the buy, we noticed a serial or stock number engraved on the back, but didn’t see a quality or maker’s mark. 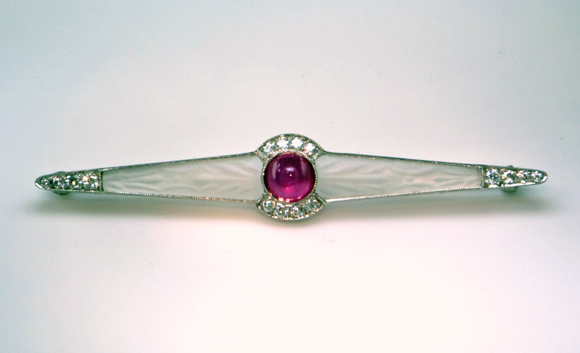 The piece tested to be 14K white gold,and was set with Old European cut diamonds and a fine natural star ruby, so we were happy to to purchase it. 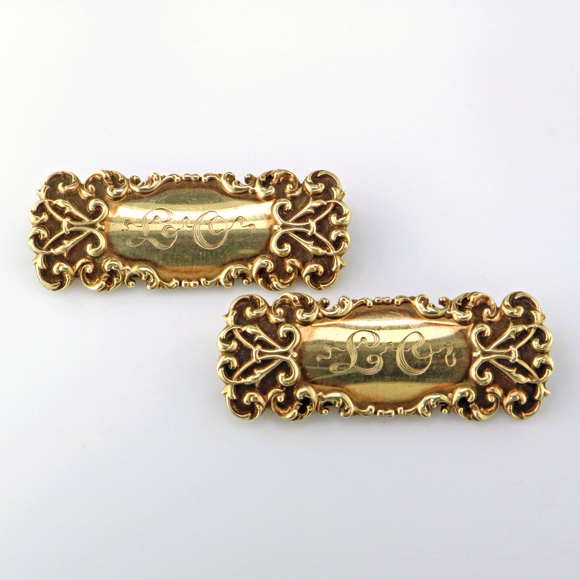 Afterwards, examining the pin more carefully, we spotted a maker’s mark on the pin stem– “Marcus.” We purchase vintage and antique jewels by Tiffany, Krementz, T.B. Starr, Whiteside and Blank, and other famous American makers, but this was our first piece by Marcus & Company! 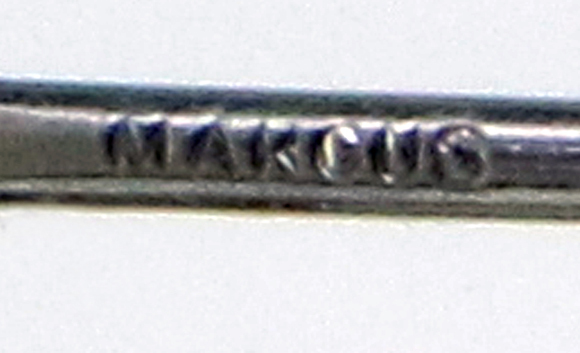 Marcus & Company was famous for meticulous craftsmanship, for the use of unusual gemstones and fine enameling and for innovative designs inspired by the French Art Nouveau movement. Marcus & Co. jewelers worked in the Paris workshop of Rene Lalique to learn the art of enameling. 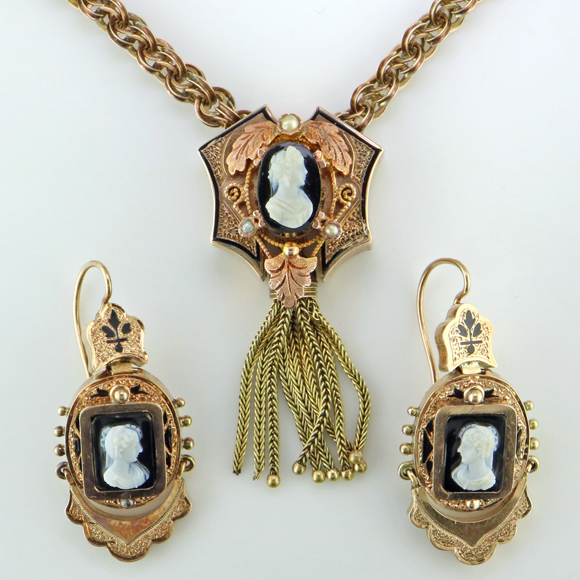 Throughout the late 19th and early 20th Century, Marcus & Co. was responsible for some of the most unique jewelry created by an American jewelry house. 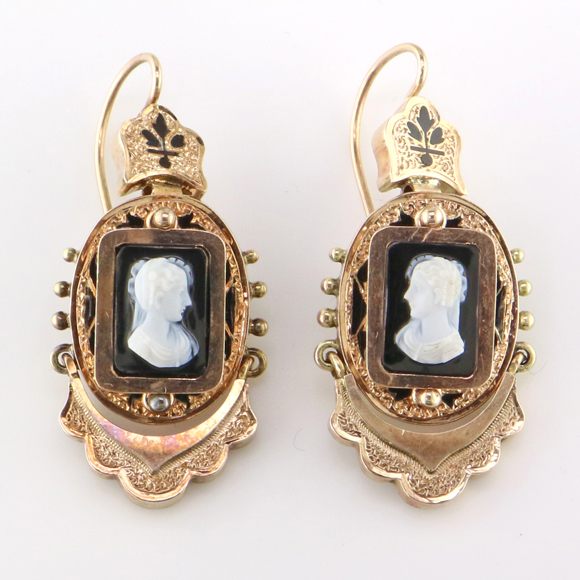 Marcus & Co. pieces are rare and highly collectible. The combination of gem materials in this pin is unusual and interesting. 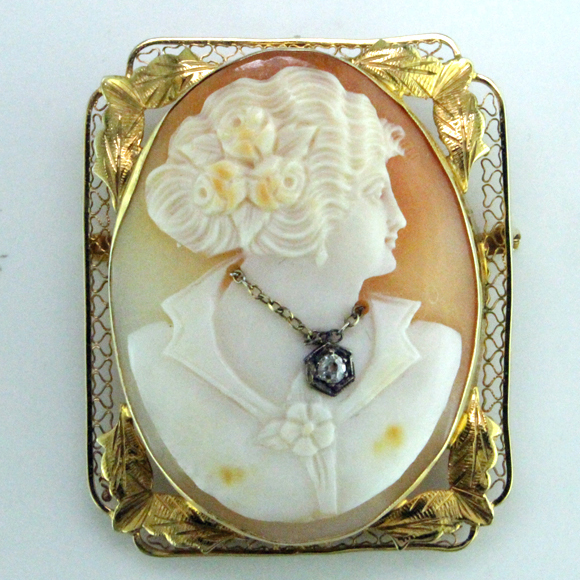 The carved and frosted rock crystal quartz flanking the center was in keeping with the “camphor glass” look that was all the rage during the 1930’s. 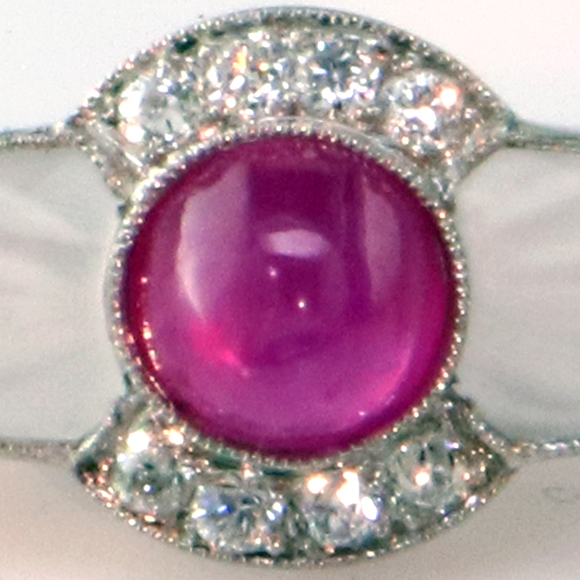 The soft white quartz contrasts nicely with the bright red center, a natural cabochon star ruby. The inclusions in the ruby produce a weak star and prove it to be unheated and from Mogok, Burma. The color is vivid violetish red, known as pigeon’s blood red. Old European cut diamonds finish the ensemble of gems and brighten the look. Besides being the pinnacle of Art Deco styling, the 1930’s were also the Golden Age of Aviation. This pin reminds me of an airplane propeller. My father learned about airplanes and became a pilot during the 30’s, so this piece goes into my personal collection for a couple of good reasons. 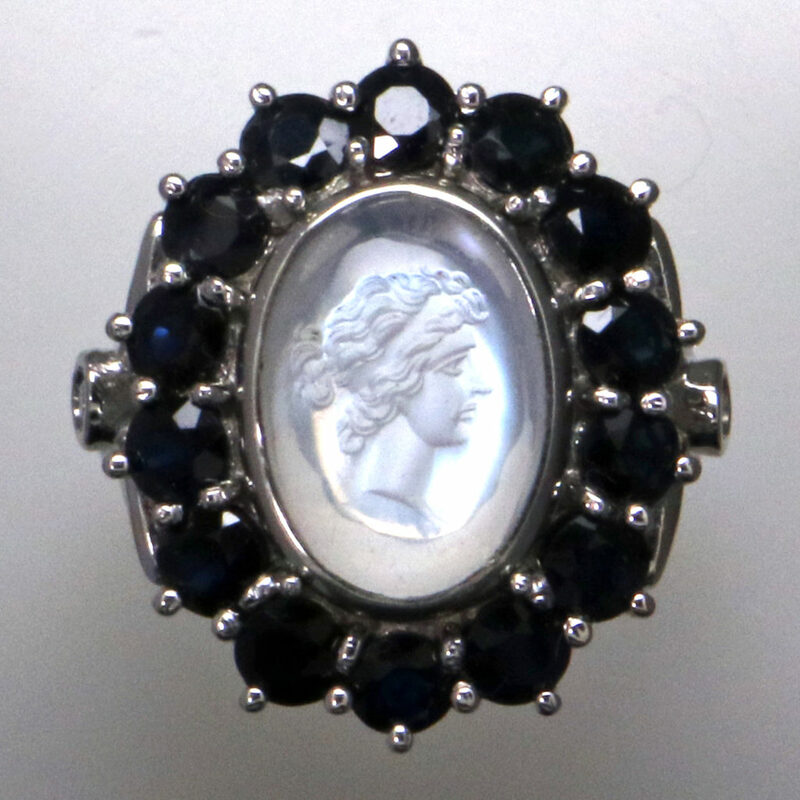 At Mardon, we buy estate jewelry on a daily basis, so we always have new and interesting things to show. If you have jewelry you’d like to sell, please give us a call. We’ll be happy to verbally appraise your items– no fee will be charged if you sell us your items. We buy for cash or trade for store credit. For high value items, we offer consultation and assistance for selling at auctions by Sotheby’s, Christie’s, and other prominent auction houses. We’re open Tuesday through Saturday, 10 am to 5:30 pm– Please call for an appointment. Mardon Jewelers just acquired the latest diamond testing device from the Gemological Institute of America, the GIA iD100. This desktop instrument uses spectroscopic technology to separate synthetic and imitation diamonds from natural diamonds. 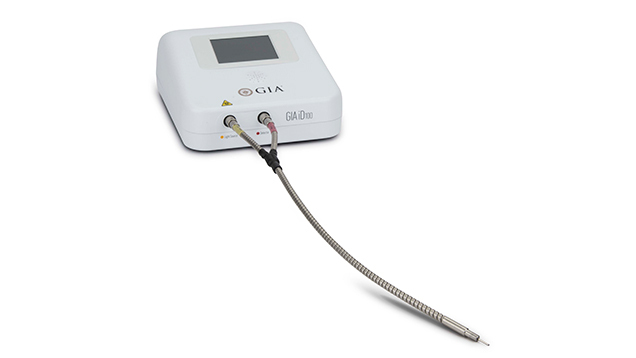 The GIA iD100 was developed to inform and protect both jewelers and consumers. Because of recent technological advances, laboratory grown diamonds are now widely available in sizes suitable for jewelry. Synthetic diamonds aren’t easily identified by normal gemological testing. 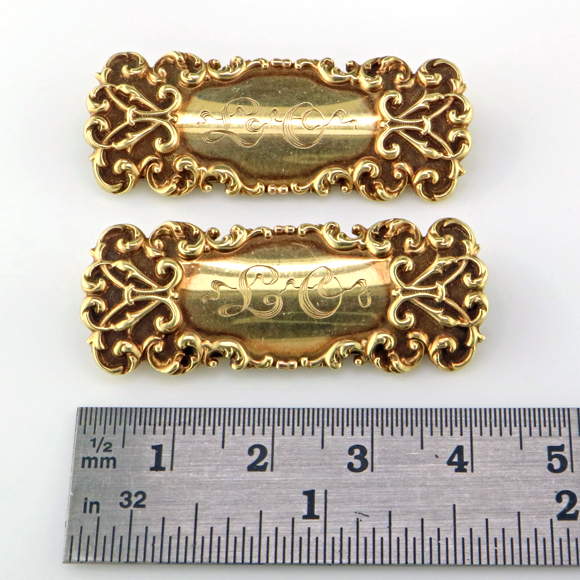 Most companies label their product with laser etching on the girdle, but unmarked stones are showing up in the market place, posing problems of disclosure. For centuries, natural diamonds have been valued highly because they are beautiful, durable, and rare. Synthetic diamonds are now being mass produced, so they are not rare. Since synthetic diamonds usually sell for about one third the price of natural diamonds, it’s very important for jewelers to know what they are selling and for consumers to know what they are buying. The GIA iD100 gives very straightforward results quickly and can used to show consumers whether a diamond is natural or synthetic. Over 98% of natural diamonds are type I while all synthetic diamonds are type II. The tester recognizes the luminescence of type I diamonds and gives them a “Pass”. Synthetic and imitation diamonds generate a “Refer” signal, meaning further study is needed to identify the stone. Type II natural diamonds also referred, but these are very rare. Gemologists usually identify type II natural diamonds by natural inclusions and other characteristics. As part of our appraisal and buying services, Mardon is proud to offer the latest methods for evaluating jewelry and gems. Even though new technologies like the GIA iD100 are very expensive, we know these investments are worth it in the long run. By keeping up with these new developments, we’re able to offer the best merchandise and expert services available to our clientele. People have many reasons for wanting custom jewelry. Sometimes, they want something new and exciting, sometimes they need a problem fixed, sometimes it’s to replace or recreate a special piece. The artisans of Mardon solve all sorts of design requests and challenges– in addition to our in-house design services, we work with the best crafts people in the business for expert hand engraving, stone repair, and enameling. Owning unique one-of-a-kind jewelry sets us apart. This couple wanted easy to wear wedding bands with a vintage style. Designer Jenny Sweaney created this original floral design reminiscent of the Art Deco style. 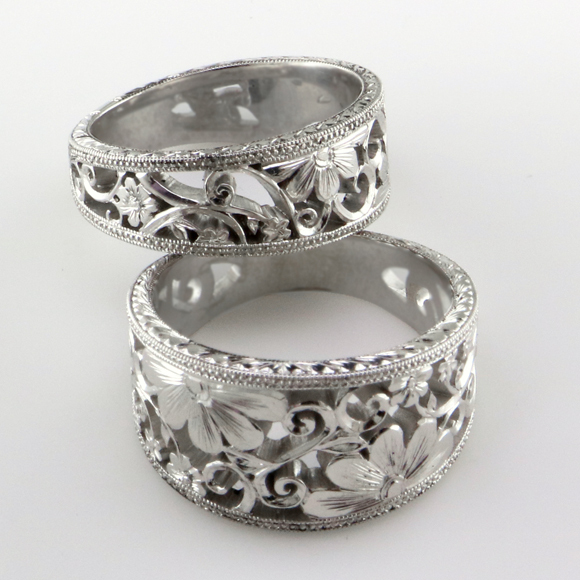 The open work is perfect for hand engraving. These beautiful wedding bands will make this couple’s ceremony memorable and will draw admiration for their marriage in the years that follow. This gentleman wanted a simple elegant ring with a matched pair of high quality diamonds to celebrate his 40th anniversary. We found the perfect diamonds and followed his suggestions for the design. After many years of marriage, this lady wanted a new wedding ring. She had a good idea what the design should be- We adapted her idea to her gems. Along the way, we recut her chipped Old Mine cut family diamond. We like the combination of an antique diamond with this modern look– it really works. 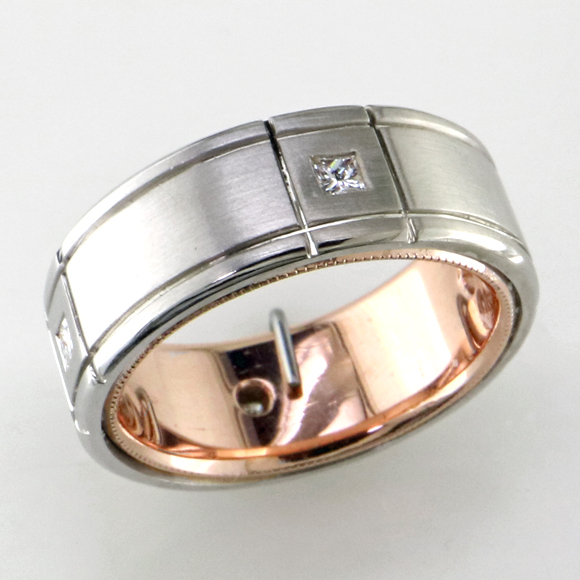 This man lost his unusual wedding band– we recreated it in platinum and rose gold with princess cut diamonds. This client kept losing sapphires from her ring. It was a design flaw that wasn’t repairable. 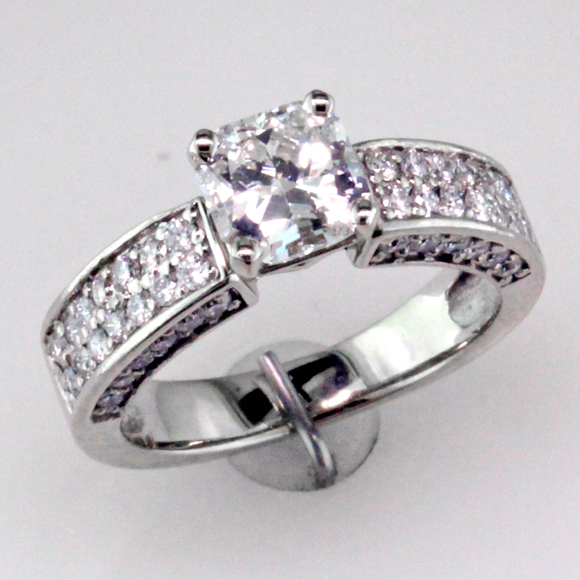 We re-engineered the design with more secure settings for her stones while keeping a similar look. Now her new ring is problem free. 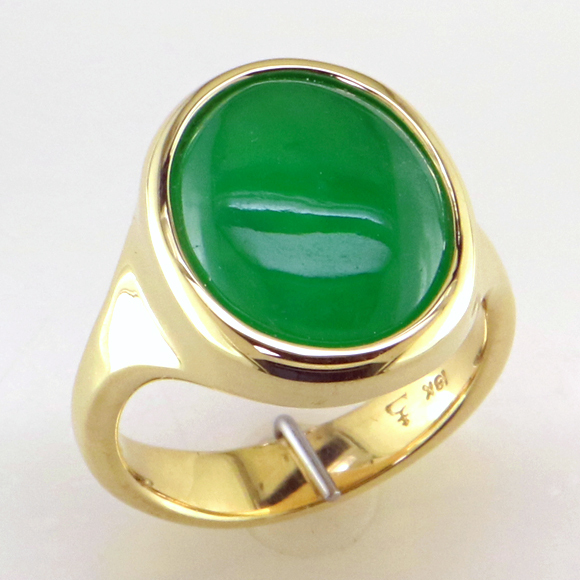 This lady received a wonderful natural Jadeite from friends on one of her many trips to China. Our custom setting shows off her gorgeous gemstone and suits her lifestyle to a T- She was ecstatic with the result! 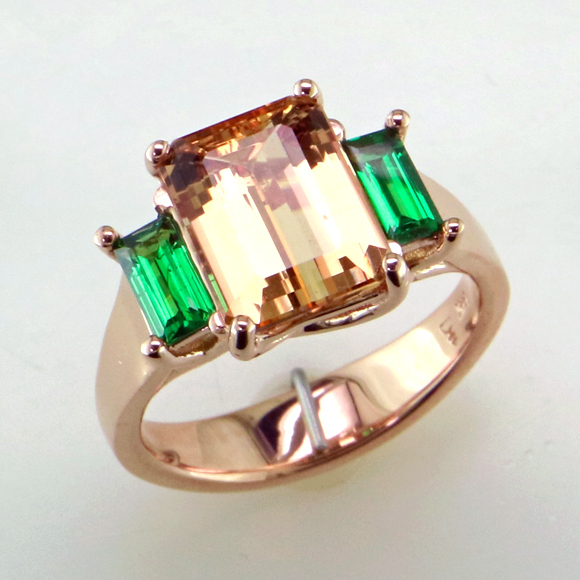 This shopper bought a fine Imperial Topaz in Brazil and wanted an unique setting. We matched it up with a perfect pair of rare Tsavorite baguettes. The step cutting, the colors of the gems and the rose gold work together in beautiful harmony. Pallasite Peridot from the Stars! This pair of custom earrings features gems that are literally out of this world! This couple waited for two years for a specialty lapidary firm to locate and cut this matching pair of Pallasite gems. Pallasite is an unique variety of peridot– the Pallasite crystals form within meteorites and fall from the heavens! CAD whiz Jenny Sweaney worked for several weeks developing the perfect design to show off these ultra rare gems and to express the couples’ feelings for each other. 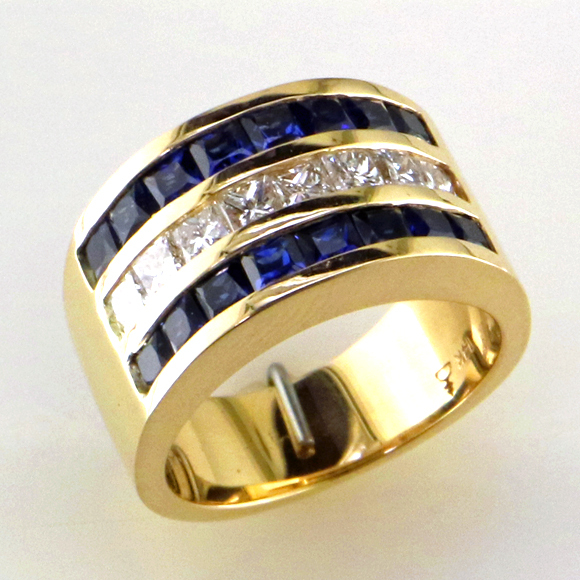 Custom made jewelry is a Mardon specialty. It’s one of the special parts of our skill base that keeps us looking forward to our work each day. 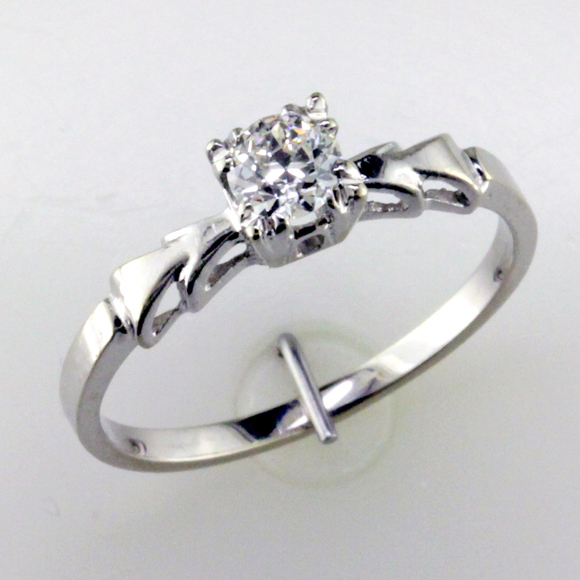 Our state of the art CAD jewelry design software allows our clients to participate in the design process and to see precisely what their jewelry will look like before it’s made. We produce castable models with a 3-d printer, a computer controlled milling machine, as well as by hand carving. You can see from these examples how versatile custom jewelry can be. 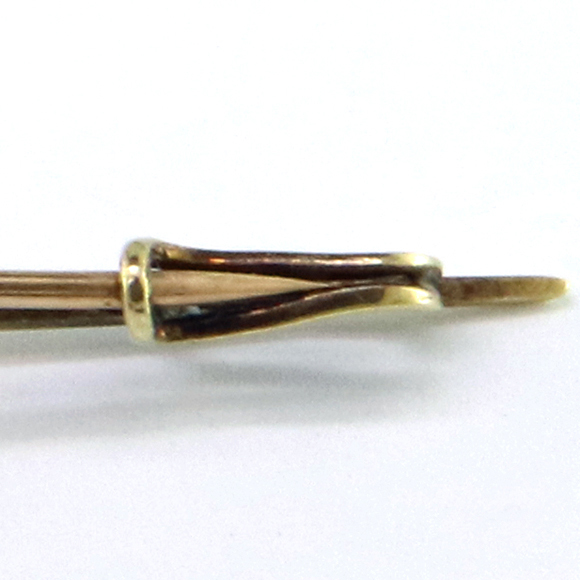 We recently acquired this sweet little diamond and 18K gold pin from the late 19th century. It’s a perfect example of the ideas behind the Arts & Crafts movement– made by traditional fabrication methods using simple tools to create simple forms and styles of decoration. 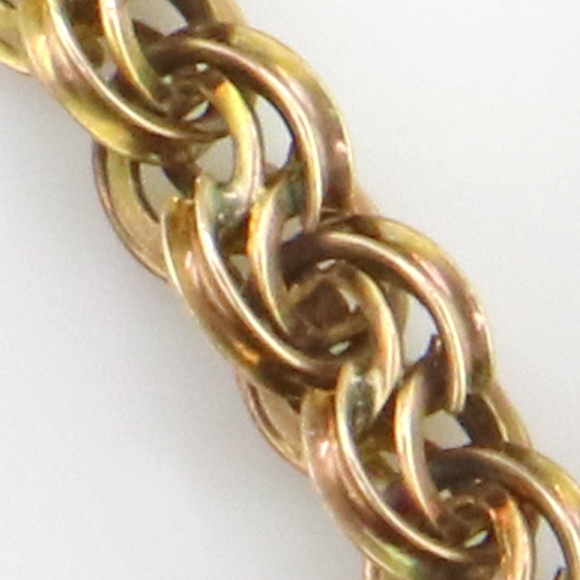 The jeweler made the main stem of the piece by forging 18K gold wire into a tapered form. 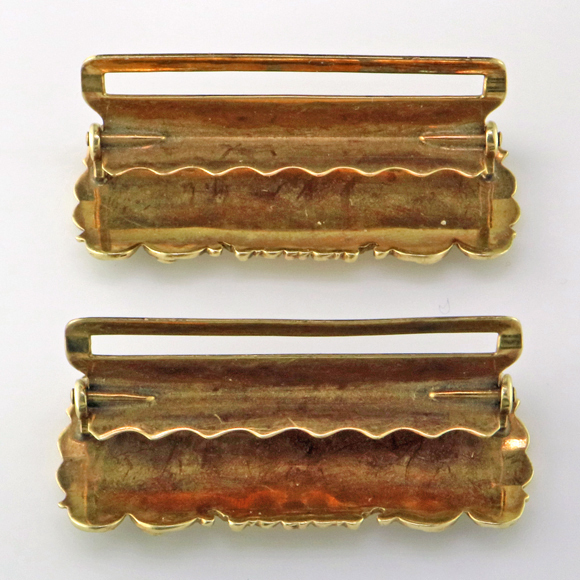 He used a jeweler’s hand saw to split the large end of the taper to form a Y to which he added a crescent wire of gold. He soldered the stem to the diamond setting which is composed of three concentric circles held in position by gold cross bars. Notice how he curled the ends of the Y into a simplc decorative element. A pin assembly was added to complete the metal work, then the diamond was set and the pin polished. We’ve left the patina of age on the pin. 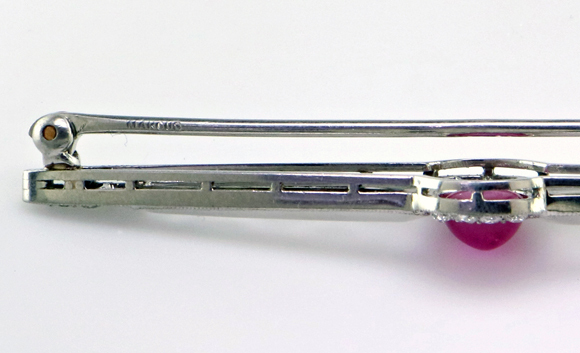 The most interesting part of the pin is the innovative way the jeweler made the pin catch. It’s just a gold wire loop formed into an elegant S shape, soldered to the back of the main tapered wire. 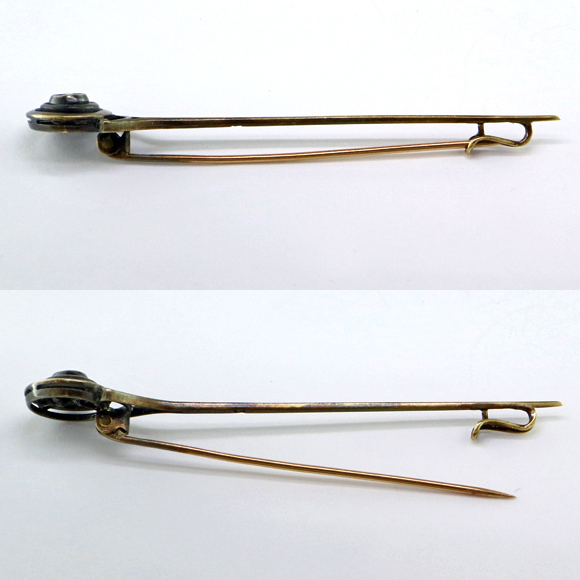 A gold wire attaches to and stabilizes the loop on one side, while the opposite side is left open for the pointy end of the pin stem to fit into. The wire is perfectly shaped to cover the sharp end of the stem. The simplicity of this important part of the jewel is remarkable, especially when you compare it other pin catches of the period and after. Most have moving parts which have to be properly aligned in order to work properly. They can be tricky to operate and are easy to bend out of shape. At Mardon, we always adding new items to our estate department. Not only are these items beautiful, they often teach us about our history, not only of jewelry but also of our culture. We incorporate these lessons into many of the original and custom works we create right here in Rivcrside. Stop by at our new location soon, at the Canyon Crest Towne Centre, next to the Rite Aid. Starting Tuesday, November 28, we’ll be Open 7 Days A Week for your shopping convenience, Sunday thru Thursday, 10 – 5:30, Open Late, Friday & Saturday, 10 – 8 pm. For the 9th year in a row, Mardon wins the Press Enterprise Reader’s Choice award! Last night, Kaye and I attended the PE Banquet & Awards Ceremony at the beautiful Riverside Convention Center. We saw familiar faces, met new winners, and the food was great! Congratulations to Gordon Bourns for the PE Community Service award– well deserved! You’ll be able to see all the winners in the Best of Inland Empire supplement in Sunday’s Press Enterprise, and you can see it online at PE.com. This will help you find the best shopping, dining, and services in the area. We’d like to thank all of you, our loyal customers and patrons– you’ve stood by us over the years and helped us build our unique business. Our mission is to provide outstanding merchandise and customer service to the Inland Empire– with your support, we’ll continue to grow and prosper. Our new shop here at the Canyon Crest Towne Centre has been very well received by our customers– the store is open, comfortable and spacious, making it much easier for you to browse and shop. It’s easy to get to and has lots of free parking. Business has been very good so we’ve been able to add an employee – stop by and meet Stephanie Holcomb, our newest Mardon staff member. While our business has based in Riverside since 1961, it’s been very gratifying to see folks coming to us from cities all over Riverside county, including Corona, Temecula, Murrieta, Lake Elsinore, Ontario, Redlands, Yucaipa, Desert Hot Springs, and others. We’re even drawing customers from San Diego, Orange County, and Los Angeles County, and of course, our website brings customer from all over the United States. One of the things we’ve tried to do over the years is keep up with new technologies that help us do our work better and more efficiently. This year, we added the Ortery PhotoBench, a sophisticated system for photography and videos. Scott Christiansen, our Tech Wizard and Chief Science Officer has been very busy over the last few months –you can now see videos of our fine jewels here on the website. 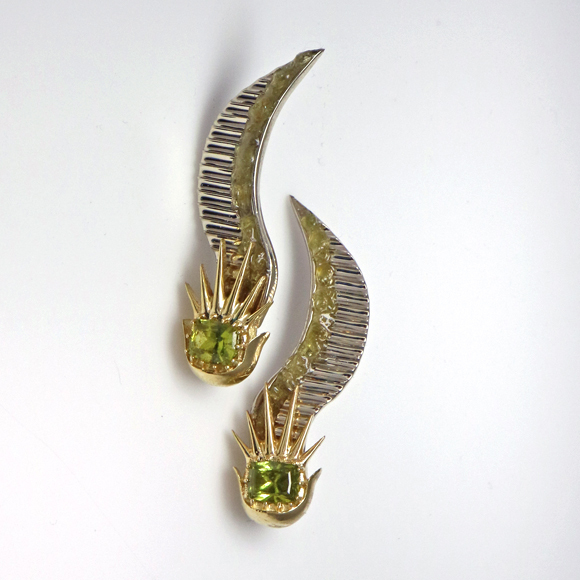 Jenny Sweaney has been creating outstanding new one-of-a-kind jewels. Here’s a fabulous ring featuring a vintage carved intaglio Moonstone– a rare gemstone from bygone days. 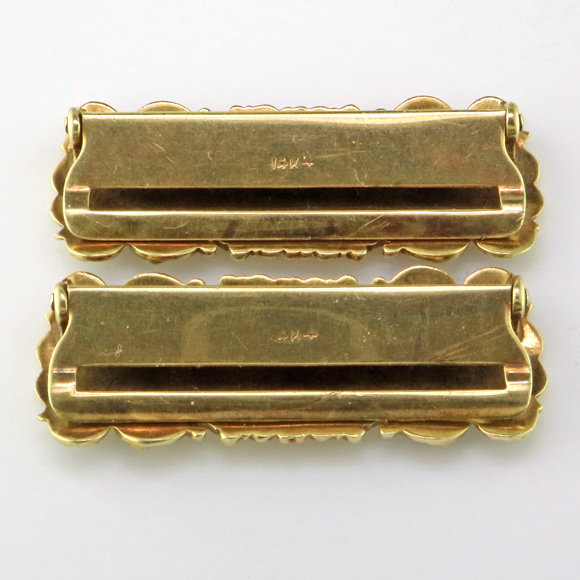 Our Estate Department continues to grow, so you can find new pieces weekly. Our repair department is busy as always, but stands ready to repair or restore your jewelry with expertise and TLC. Our Appraisal Department stands ready to serve your needs, whether for written appraisals for insurance or estates or for verbal consultations so you’ll know the value of your jewelry. We’re open to buy most fine jewelry and precious metals – stop by for a quote. Thanks again for the vote of confidence– we’ll keep working hard to deserve your trust and patronage. If you haven’t already been by the new shop, please visit us at Canyon Crest Towne Centre, on the center parking lot right next to the RiteAid drug store – Easy to find if you enter thru the Central Ave. entrance. We’re here Tuesday thru Saturday, 10 to 5:30. See you soon! It’s that time again! Mardon’s Fabulous Annual Clearance Sale is on! Beginning Friday, Sept. 1 thru Saturday, Sept. 9 we’re discounting our inventory of fine Mardon Originals, unique Estate pieces, and Designer Jewels. You can realize extra savings from 10 to 60% on fine merchandise and we can make way for new items in time for the holiday season. 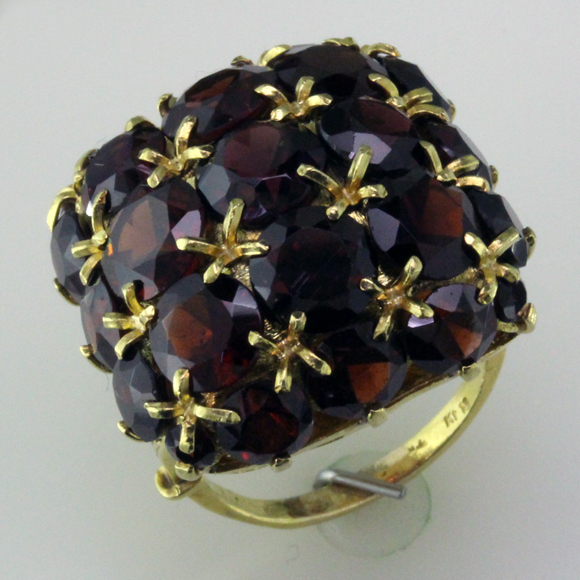 Here’s a grand Estate ring, a lush statement piece of red garnets and 18K yellow gold, discounted from $895 to only $626.50 + sales tax– that’s a savings of almost $270! 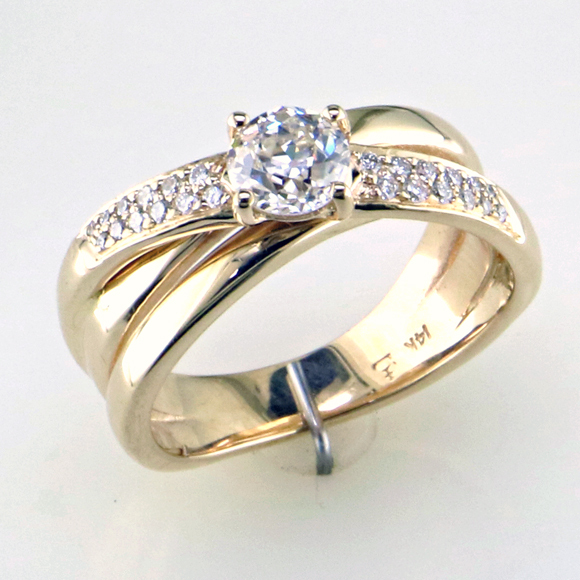 We have lots of beautiful estate engagement rings, from vintage to modern styles. 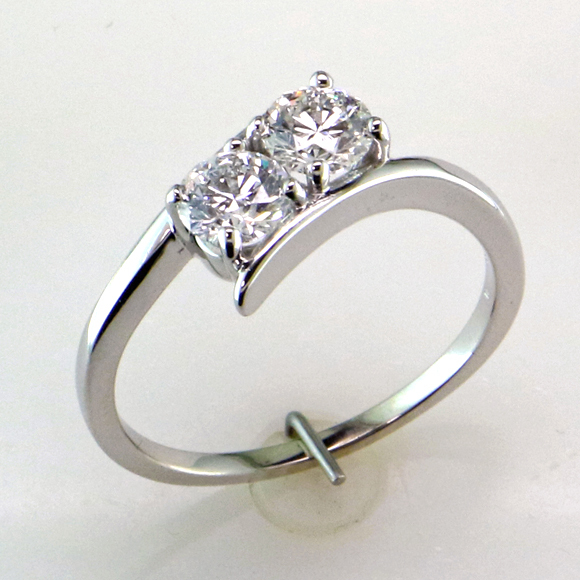 Here’s a sweet little Art Deco white gold engagement ring set with a sparkly Old European cut diamond weighing .28 ct. Perfect for the young couple just starting out. Was $495, will be just $346.50 + sales tax. We’re even discounting our magnificent Mardon originals. This One-of-a-Kind design by Jenny Sweaney features one of the most beautiful emerald cut natural pink sapphires you will see, 1 1/2 cts of perfect pink, accented with triangle blue sapphires, diamonds, and rose gold. Simply stunning! 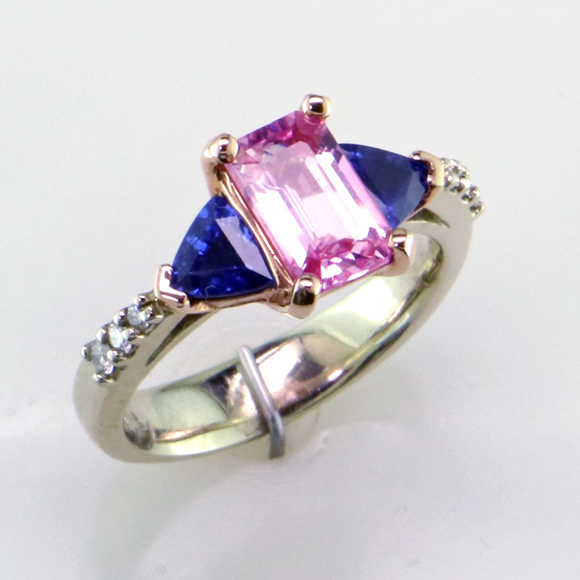 I-25261 1.56 ct Pink Sapphire, 1.07 ct Blue Sapphires, .08 ct Diamonds in 14K Rose Gold.